The short-term effects of marijuana are generally felt within a few minutes. But how does marijuana affect each part of your body and how does it reach the brain? We visually present what happens to marijuana after you take it in this infographic. Do not take the use of marijuana lightly! Instead, understand more about what marijuana does to your brain and body. 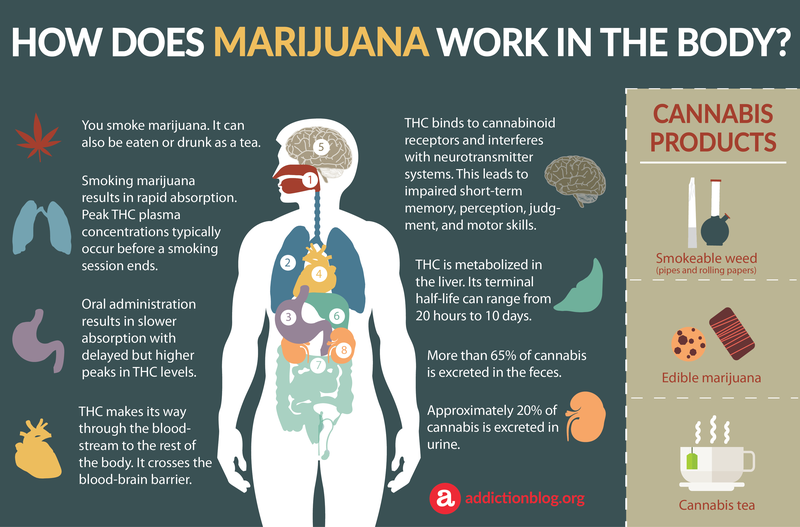 In this marijuana infographic, we show the route that marijuana takes to get to the brain via the body. We look at the metabolism of marijuana in the body and how it affects almost every organ therein. Don’t forget to post any questions you might have at the end section. We’ll make sure to answer you ASAP. 1. You smoke marijuana. It can also be eaten or drunk as a tea. 2. LUNGS: Smoking marijuana results in rapid absorption with peak THC plasma concentrations occurring prior to the end of smoking. 3. STOMACH: Following oral administration, absorption is slower and has a more delayed peak in THC levels. 4. HEART: As cannabis gets absorbed into the body, THC makes it’s way through the bloodstream to the rest of the body. 5. BRAIN: THC binds to cannabinoid receptors and interferes with cannabinoid neurotransmitter systems. Weed leads to impaired short-term memory, perception, judgment and motor skills. 6. LIVER: THC is metabolized in the liver. The terminal half-life of THC can range from about 20 hours to 10 days, depending on the amount and potency of the marijuana used. 7. COLON: More than 65% of cannabis is excreted in the feces. 8. KIDNEYS: Approximately 20% of cannabis is excreted in urine. Does this infographic answer your questions and concerns about how marijuana travels to the brain and throughout the body? If you have additional questions, please feel free to post them in the comments section below. We are happy to answer all legitimate inquiries personally and promptly. In the case that we don’t know the answer to your question, we will gladly refer you to someone who can help. NIH: What are marijuana’s long-term effects on the brain? How long will it take to for THC effects be gone? I have smoked marijuana 4 weeks ago but I can still feel the symptoms of being high and experiencing to much anxiety, and difficulty in falling and maintaining sleep. Will I be back to normal again? Hi Luke. If you still experience some negative effects, I suggest that you consult with a doctor. I smoked marijuana 4weeks ago, just tried it for the first time, and it really hit me hard and caused me derealization, paranoia and anxiety, although the effects have subsided the next day, why can i still feel the symptoms of being high, and experiencing anxiety and mild deperaonalization until now? Will i be back to normal again? Thanks for the answer. Hi Luke. You’ll be okay. If you have any questions, call 1-888-503-1835 for a toll-free and confidential marijuana helpline available 24 hours a day, 7 days per week.